I know I have mentioned this before, but if you didn’t know, we have easy access to raw milk. In SC, raw milk is legal to sell. We hadn’t even tasted raw milk prior to moving here. In CO, you had to buy a share (upwards of $150) of a farm and then buy a gallon (upwards of $10). I had read a lot about the tasty, nutritious, mysterious raw milk, but it had never passed my lips. A neighbor told us about a little family farm, really close to us, Harmony Dairy. I’ll have to do a post in the future, just so you can see pictures of where I go to buy my milk. It’s literally the farm your parents told you that “Rover” went to when he got too old. I get out of my jeep after going through multiple chained gates (free roaming animals are happy, but also dangerous for cars!) and pull up to a refrigerated cooler that says, “Drink Milk.” I put my $5 in a little tool box and grab my delicious raw, un-homogenized, full-fat, cream on the top milk. On my way out, I usually pet a calf or two, whisper to a pig of give a loving nudge to a dog or chicken. Are you in love yet? We aren’t big milk drinkers. My milk usually ends up fermented in some variety (yogurt or kefir), in a roux, and I use it in my coffee every morning. I usually get a gallon every two weeks. Except recently I’ve been buying more and more, ever since making homemade ricotta! I’ve never been a big ricotta fan. I mean I buy it once a year when I make lasagna and never think much of it. That has definitely changed. While it takes some time (not much though compared to any other cheese), it is definitely worth it. You have a few minutes while the milk heats. Go nuts. Me? I play with this beauty. I’m shameless. Sorry. I couldn’t let one post go by without a pic! 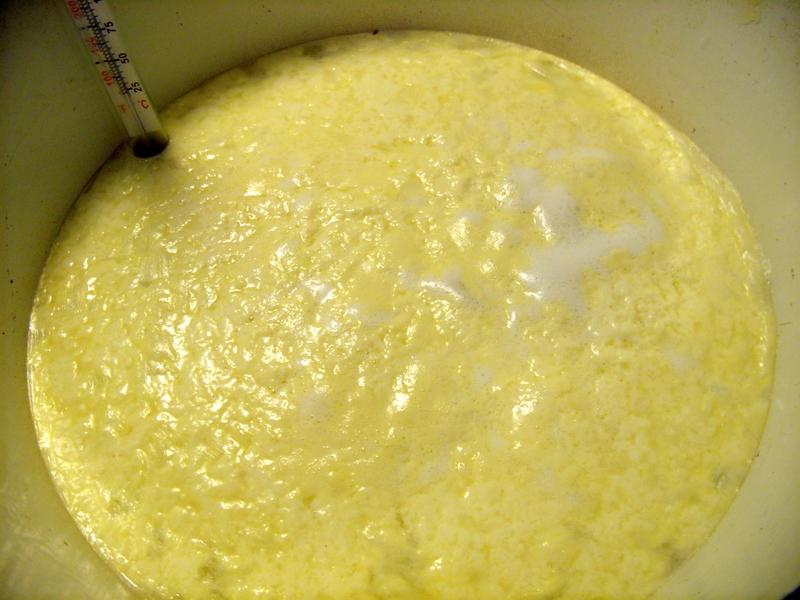 I heat the milk with the acid (lemon juice) and the curds and whey separate and just before it erupts into a boil is when I shut off the heat. You can see the bubbles about to surface and the temp is around 200-205. And then the straining begins. It takes a little while for me as I only have this little sieve. Quadrupled lined with cheesecloth, it’s ready to go. I pour and drain and pour some more and drain some more. 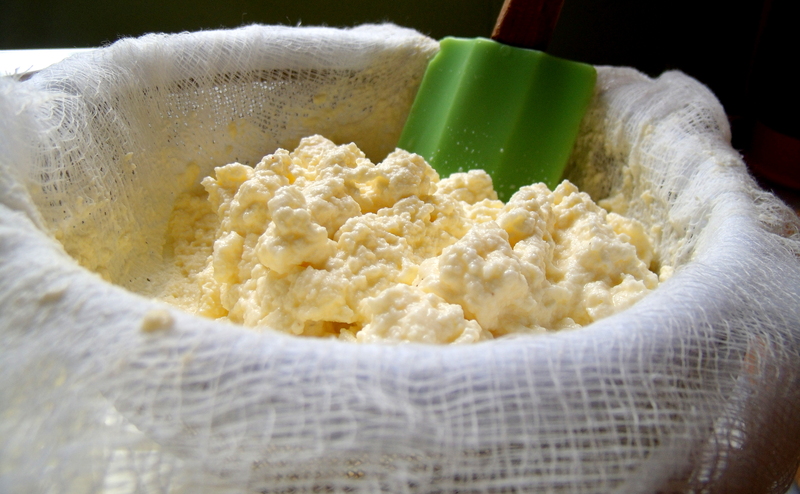 You can stop the straining process when it looks and feels like ricotta to you. I like mine a little on the wet side. Then I liberally sprinkle with sea salt. And eat it. And occasionally it makes it into a beautiful dish like this one. 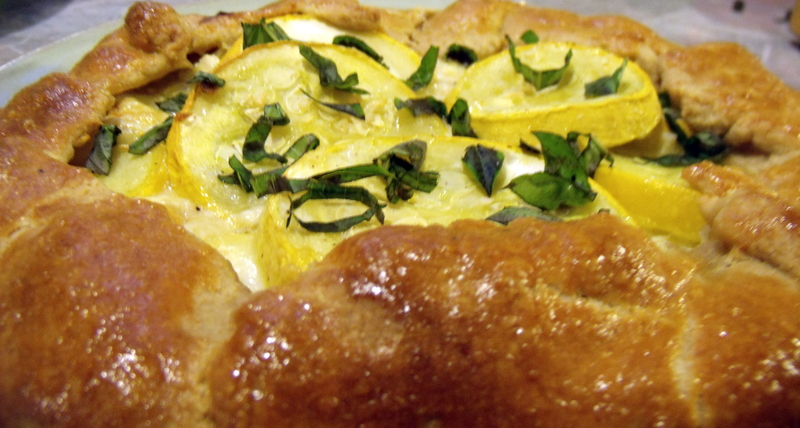 Summer squash and ricotta galette. Divine. 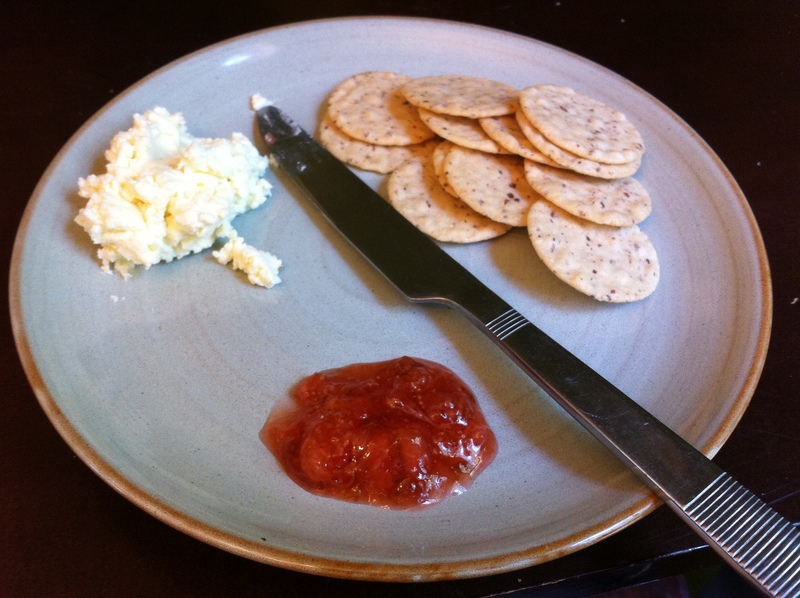 Or on a plate alongside crackers and fig jam for an elegant snack. 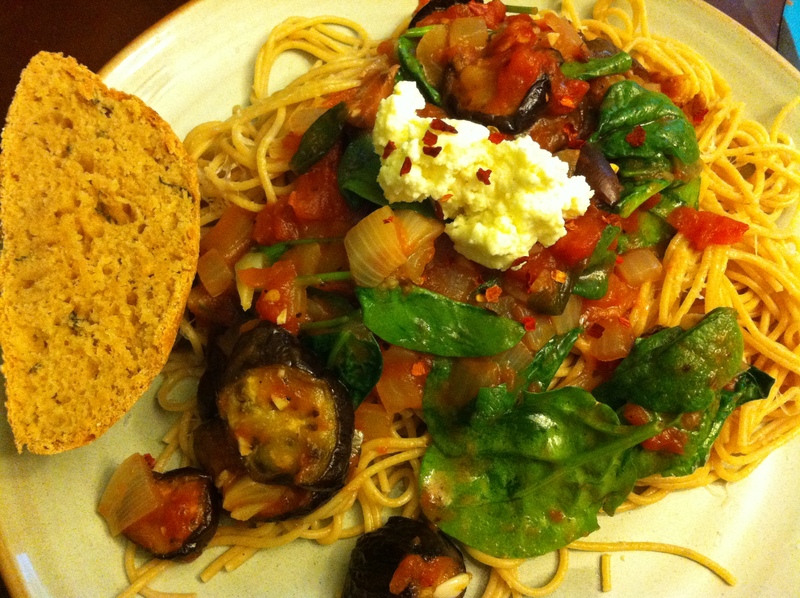 Or on top of a plate full of pasta instead of parmesan for a rich, creamy addition. So, go ahead, make some ricotta. I promise you’ll find ways to use it! 1/2 gallon whole milk (DO NOT use ultra-pasteurized milk, which is basically any organic milk sold at the grocery store. It will not curdle, I learned this the hard way a long time ago! If you don’t have access to fresh milk, look in the store for a low-pasteurized alternative. For instance, I know Publix’s whole milk is low-pasteurized). In a large, heavy-bottom pot (dutch oven or cast iron is great here), add milk and lemon juice, stir briefly. Set heat to medium-low heat. Heat milk until it reaches 175 degrees at this setting. This take about 30-50 minutes. After it hits 175 degrees, raise the heat to medium-high and watch closely. 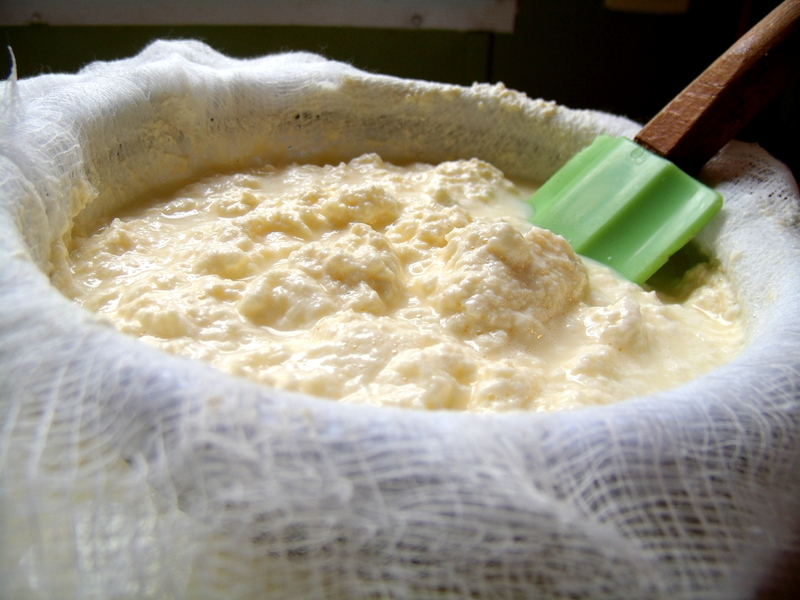 You will see the curds begin to separate from the whey (pictured above) and the whole thing will look like it’s about to erupt into a rolling boil. Shut the heat off before this happens. Let it sit for a few minutes while you get the straining station set up. Over a large bowl, set your sieve and quadruple line it with cheesecloth. Pour the curds and whey into the bowl and let it drain. I keep adding liquid as it drains down. It takes me about three dumps. I get in there with a spatula (pictured above) and help the liquid get under the curds by lifting and folding with the spatula. Once it looks and feels like ricotta to you, it’s done! Again, I liberally sprinkle with sea salt, but do your to your taste preference. Yes, this means start eating it now. Keep in air-tight container in fridge for over a week. This entry was posted in appetizer, cheese, dairy, Gluten-free, homemade, Uncategorized by callywoodfarms. Bookmark the permalink. I’ve done this before! The store bought stuff never tasted the same afterward. Thank you for sharing with us at the HomeAcre Hop! We’d love to have you back tomorrow.